Who doesn’t like a BOGO deal? Celebrate Spring! Bring the family out for a day in Gettysburg. Enjoy A Buy One Get One Free Offer at the Soldiers National Museum. This offer cannot not be combined with other offers. One coupon per family per visit. This Offer is valid through May. 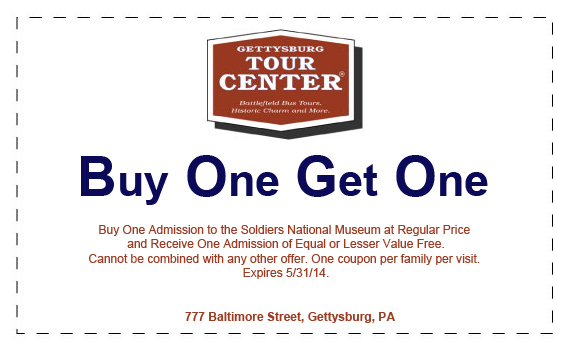 Posted in Blog, Coupons, Soldiers National Museum and tagged Buy One Get One Coupons, Gettysburg Battlefield Tours Coupons, Gettysburg Coupon, Soldier's National Museum, Soldiers National Museum Coupon on May 1, 2014 by Gettysburg Battlefield Tours.